The Portable Kettlebell from PKB is different from every other adjustable kettlebell on the market. As the name suggests you can take this kettlebell just about anywhere. 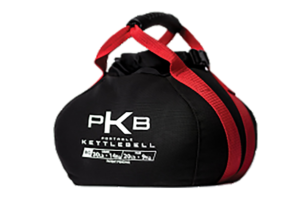 Unlike other adjustable kettlebells, the PKB Kettlebell is made from Nylon and weighs just 10 oz. What about the weights? I hear you ask. Well, there’s no need to carry additional weights around as you choose your own weight. What’s meant by this is that the PKB Kettlebell can be filled with water, sand or just about anything you can get your hands on. Awesome huh!? I was pleasantly surprised by the PKB Kettlebell. Whilst it is not strictly a kettlebell, you can use it for most kettlebell workouts, plus a ton of other strength/resistance workouts. What I particularly liked about the PKB Kettlebell was the fact I could integrate it other workouts. For example, I took the PKB with me on my runs. Filling it with sand, I was able to carry it on my back for a more intense run. I also started integrating kettlebell workouts at the end of my run instead of doing them at home. Note: You can also purchase the PKB Kettlebell as a set which includes all three sizes above. Each is made from a hard wearing Nylon that’s resistant to punctures and tears. Although I cannot vouch for this personally, I had no problems when filling mine with sharp rocks and repeatedly dropping on the floor. The bags are covered with nylon straps that wrap around the bag and meet in there middle to form a handle. Finally the handle is covered in a rubbery grip for maximum comfort. The great thing about the handle is that there are none of the annoying bobbles you get with standard kettlebells. It’s generally smooth and grips very well. To adjust the weight you just open up and un-buckle the pouch that’s located beneath the handles. From here you can go ahead and add your weights. As mentioned this can be water, sand, rocks. Basically anything you can fit inside the PKB Kettlebell can be used as the weight. 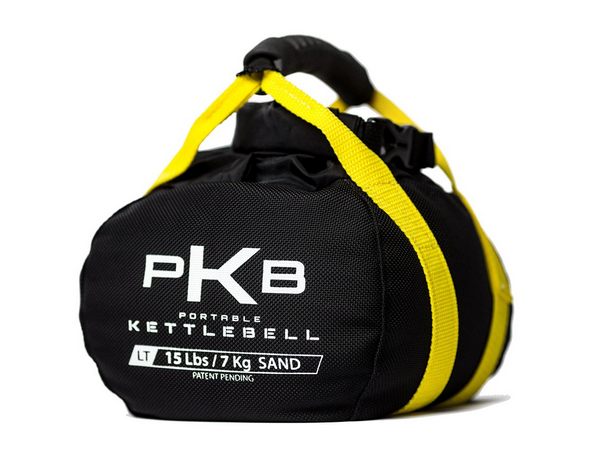 To avoid getting sand etc stuck inside the PKB bag my advice is to first put it inside a carrier bag, and then into the PKB Kettlebell. Note: If you plan on filling the PKB Kettlebell with water, you’ll need to purchase the water bladder separately. Ultimately, I won’t be using the PKB Kettlebell for my kettlebell workouts for the reason that I don’t really class this as a proper kettlebell. It’s great if only used for a handful of kettlebell routines but not something you could use for everything. Whilst the method of adjusting the weights is ingenious on one hand. It also hinders you on the other. For example I need to know the exact weight I am working with and this is just not possible with the PKB Kettlebell unless it’s completely full. Another problem I found was the time in which it takes to adjust the weights. If you need to adjust frequently then it’s quite time consuming and as mentioned difficult to know the correct weight. On balance this is a great alternative adjustable kettlebell and still a great choice. It’s well made, it’s portable and is virtually indestructible. It’s also very cheap as you are only paying for the PKB bag, not the weights. The PKB Kettlebell is a great alternative choice if you'e looking for more versatility and do not take your kettlebell workouts too seriously. Previous article What is a kettlebell pood anyway?